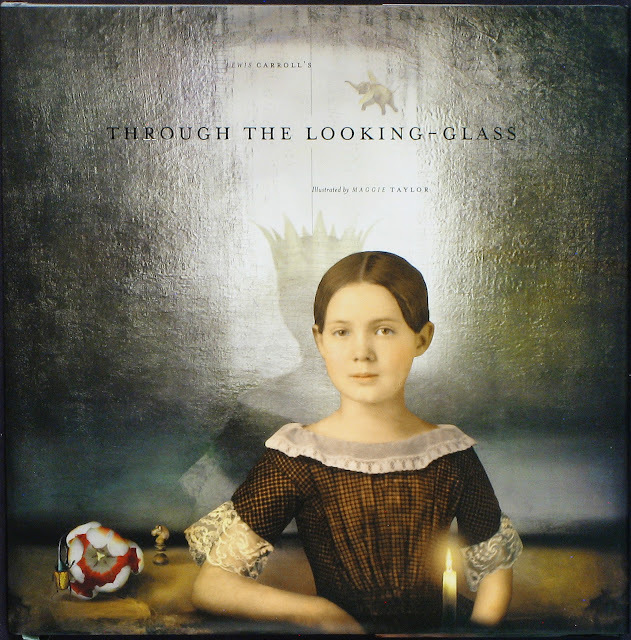 Conversation & Book Preview Gallery Director Anne Kelly speaks to Maggie Taylor about her new book Through the Looking-Glass and What Alice Found There– join us at photo-eye Gallery this Saturday, March 24th from 2-4 PM for a preview and Q&A with Taylor. 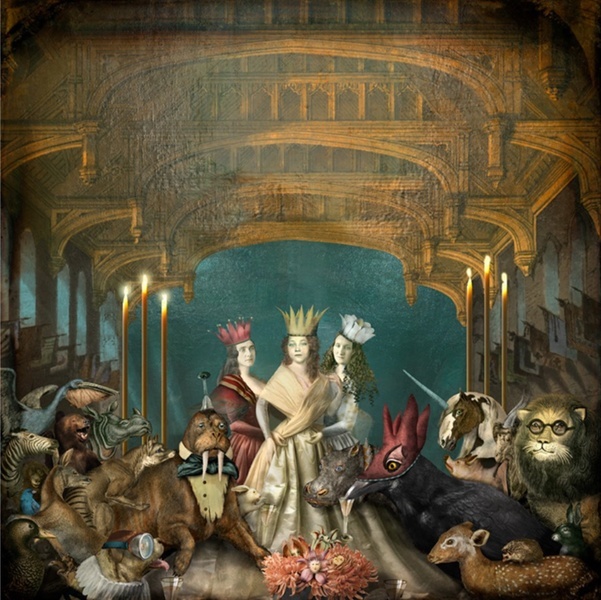 More than 5 years in the making, Maggie Taylor is finally unveiling her new book Through the Looking-Glass and What Alice Found There the widely anticipated follow up to her 2008 illustrated edition of Alice in Wonderland. 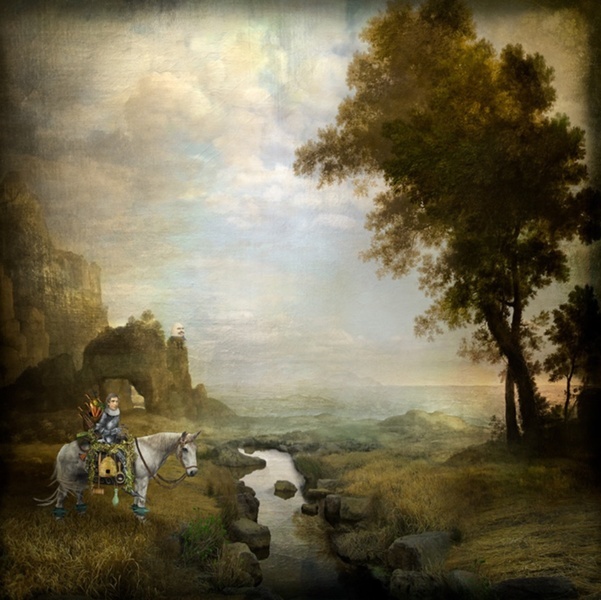 Just like the previous release, Through the Looking-Glass… features Lewis Carroll's original text in its entirety accompanied by 64 fantastical photomontages created in Taylor's signature whimsical style. 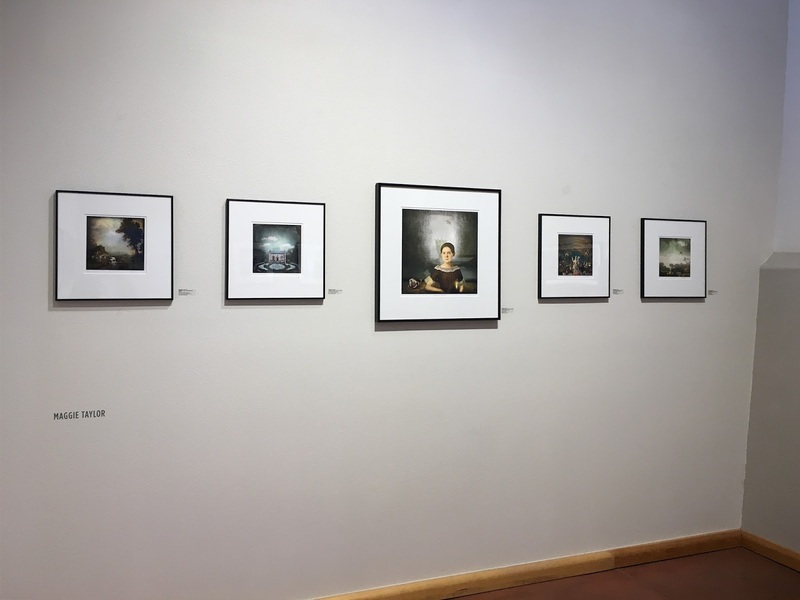 We are delighted to invite you to meet photographer Maggie Taylor at photo-eye Gallery as she previews Through the Looking-Glass and What Alice Found There. Copies of both the trade edition and limited edition will be available to handle during this event and the artist will be available to answer your questions. Please join us for this artist Q&A and rare opportunity to view this very special publication before its official release in May. Five prints by Talyor from the series will also be on view at the Gallery as a part of our Winter Group Show. Gallery Director Anne Kelly recently spoke with Taylor about Through the Looking-Glass… about the process of making the book as well as insights to how and why the work was made. Anne Kelly: We're very excited about the forthcoming publication, what can you tell us about how your new book came about? Maggie Taylor: My Alice in Wonderland book, with Lewis Carroll’s full original text, was published in 2008. There were 44 images in that series, and I have had it in mind to create images for the sequel, Through the Looking-Glass, and What Alice Found There, ever since. It took me quite a while to collect materials for all of the characters and scenes, and I began really assembling finished images for the project in 2015. Over the last 3 years, as I completed this series, I read and re-read the story countless times. I also visited the Harry Ransom Center in Austin to do a bit of research and look at some of the Lewis Carroll photography albums they have in their collection. Midway through the project I thought there would be approximately 50 images, but as I worked on them, the list of characters I wanted to include grew. Eventually I settled on 64 images, which seemed appropriate because a game of chess is the underlying structure of the story, and there are 64 squares on that board. 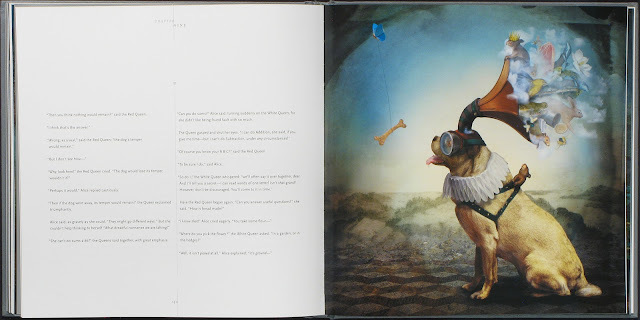 BookTease of Maggie Taylor's Through the Looking-Glass… featuring the image What remains? AK: As I understand it, you are working with the same designer as your last book, No Ordinarily Days on the new book – what was the process like? MT: The wonderful San Francisco designer Connie Hwang created the design for this book—as well as my last two books and my website. I love working with her. We kept the same overall format as the Alice book so that it can be the companion volume, but made the design more contemporary. Because Lewis Carroll made liberal use of italics in the story, the typeface needed to be easy to read, yet elegant. One italicized word in a sentence can really change the meaning of the words, so we wanted to be sure the italics were easy to spot. We settled on a typeface called Scala Sans designed by Martin Majoor in 1993. I love it! Connie used design elements to reinforce or reflect elements in the story in a very poetic way in my opinion. AK: Can you share some details about the limited edition version of the book? 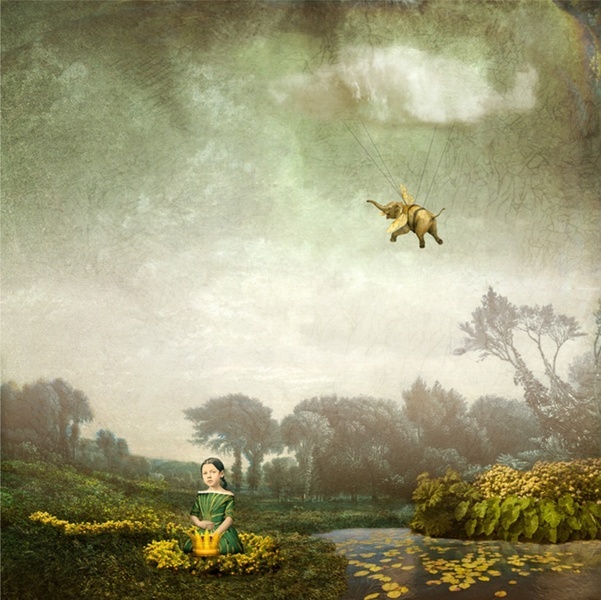 MT: The limited edition of the book consists of 100 copies that are in cloth-covered boxes and come with an 8x8 inch print of the image on the back cover of the book: And What Alice Found There. That image will not exist in the 8-inch size in any other place, so buying the limited edition is the only way to get the small version of it. AK: Anything special you'd like to share about the creation of Through the Looking-Glass…? MT: The front and back images were conceived as a pair, and they were very nearly the final images I worked on for the project this past fall. Alice appears on the front cover in the real world before she climbs over the mantel and through the mirror. In the distance you see her reflection has a crown, because once she completes her journey she becomes a queen. Also on the far side of the glass in the distance you see the flying elephant (Anything but a regular bee.) Flipping the book over, you find the mirror image of Alice as seen from the fantasy, looking-glass world side of things. Here, her reflection back in the real world has no crown, she is just an ordinary girl. But she is accompanied by some of the creatures she meets along the journey. Looking through the mirror “backwards” into the real world you also see a glimpse of the room where Alice’s story begins as she plays with her kittens by the fire. My version of that room is William Henry Fox Talbot’s oriel window at Lacock Abbey. The story was really delightful to spend time with — there are many more quirky characters than people generally recall. Also my collection of daguerreotypes grew quite a bit over the last 5 years as I looked for more potential Alices, queens and kings. AK: Any words of wisdom you would like to share about photo book publishing? worth it. There are so many little details and decisions, and it is easy to become overwhelmed. I am glad that I was able to work with a designer I trust and admire—that made the long process much more manageable. photo-eye Gallery's Winter Group Show closes on Saturday, March 24th as well. Attending Maggie Taylor's Book Preview is also an excellent opportunity to view our survey exhibition before the show closes. All prices listed are correct upon the time this post was published. Prints are limited and prices change as the edition sells. Please reach out for the most current information.